I know that many of you have been less excited about this game after recent play tests, but do yourself a favor and click on these screens. This game looks very impressive graphically. The amount of detail shown on the enemies faces and number of them on screen at once is really impressive, and everything is running in real-time. Its seems to look better than the E3 build we saw last month. Also, I'm not sure if I missed something in a previous game but isn't that a new character with Jill in a couple of those pics? Feel free to post a comment to let me know if I'm mistaken on this. Well, I'm not sure about the RE5 engine for this game but it definitley looks really good. 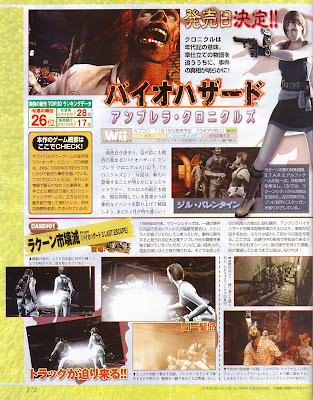 The RE5 engine (they say) was made from the ground up for the Xbox360 and PS3 so it remains to be seen if they can get it running on the Wii also in some form. But despite of the graphics of UC (which I am definitely not going for since I hate on-rails shooters) I would love to see the RE5 on the Wii. Even though it will have been based on not-so-much improved RE4 engine I am going too buy it as soon as it hits stores' shelves. Yeah I know that blown up screens from NeoGAF show that the game has dithering and some jaggies. I've seen videos of this game and those are not very noticeable. Also from a standpoint of character detail RE:UC looks great, the guys at NeoGAF will shoot down any and every screen shot for any game especially a Wii game that tries to look good like this one. Have you seen the new trailer for Metroid Prime 3? Compare that with screens and it looks like a completely different game. At least these scans I have here of RE:UC were taken at a resolution thats not out of size and blown way up to show every flaw in a 480p game. Yes, I have seen those new videos. They indeed show that the Metroid Prime 3 looks great. I am happy that at last we've got a great looking game on the Wii. Or at least the US will get it really soon because Europeans (as myself) have still more than two months to wait for it. Ouch, lets keep it clean we are all Nintendo fans here. re5 on the wii with no real hit in graphics? Are u insane? Have you seen the extended re5 trailer? It is spectacular and don't judge a game's graphics from stills one way or another - remember the stills for red steel? Anyone who believes the wii isn't under powered is kidding them selves. I'd be fine with RE5 looking like RE Umbrella if they did that on Wii. Sure it is a hit in graphics but the game will still look good. Capcom already knows this. look guys 90% of websites have said that mario galaxy is doing things graphically the same as all 360 titles out there using all next-gen graphical tricks so are loads of people right now,battalion wars,metroid not as much but not far off,smash bros doing alot graphically the best fighting game to come with insane graphics,resident evil UC,all these games and alot more support mext-gen grphic effects. I know Capcom could make a great re5 on the wii (and I'm sure they will) even if its a bit better visually than re4 it'll look great. But what game on the wii has looked visually stunning? Metriod looks like a step up from past prime games not a next gen jump. Mario Galaxy looks great but cartoon style graphics are a bit different to to the life like models you see in the extended re5 trailer.